Get beyond the headlines and the hype. 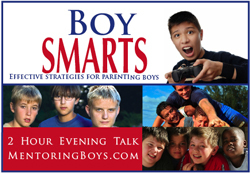 Learn what it takes for parents, caregivers, and professionals to mentor boys to become exceptional men. This presentational will look at the varied needs of boys, how we can help boys navigate our new cultural realities (Facebook, video games), how we can encourage healthy communication, and how we can help our boys become courageous, caring, and ethical men. On Tuesday, November 29, 7pm till 9pm, Cambridge Elementary PAC is hosting Barry MacDonald, an educator and Registered Clinical Counselor who is a champion for strong families, strong schools, and an advocate for boys. A sought-after speaker and authority on boys and learning, he has worked with parents, educators, and youth for over twenty-five years, nationally and internationally. Tickets are available through the Cambridge PAC (cambridgepacyac@shaw.ca) or through their school office (Cambridge Elementary, 6115 – 150 Street Surrey, 604-595-4036). Tickets are $5 in advance, or $10 at the door.